Many will have seen the critically acclaimed documentary called The Corporation. One of the key points that stuck with me was that whilst the corporation is considered a legal person, just like any other biological person, it is not accountable in the same way. The biological person will be held accountable for her actions in court on a very personal note. With the corporation, pointing out accountability is decidedly more complex, as the actions of the legal persons with the corporation and the corporation itself are legally severed. One sues the corporation, but not the people working within the corporation, no matter how much the obvious points to a situation of personal accountability: remember this guy? Now back to sustainable development. If you would want to see the firm change its behavior to a more sustainable manner of conduct, then given what The Corporation documentary highlighted, playing the accountability card is a difficult one. You can delve into the details of Harvard Professor John Ruggie’s walk on the tightrope between corporate accountability and “sphere of influence” in safeguarding human rights for waking to the complexity of the accountability issue at hand, be my guest. But, holding the firm accountable is hard, as is concisely taking up responsibility and influence for the firm, for that matter. describe how certification could incentify changes to the business model to adapt itself to (properly) internalize the standards set by certification in the firm’s activity system. 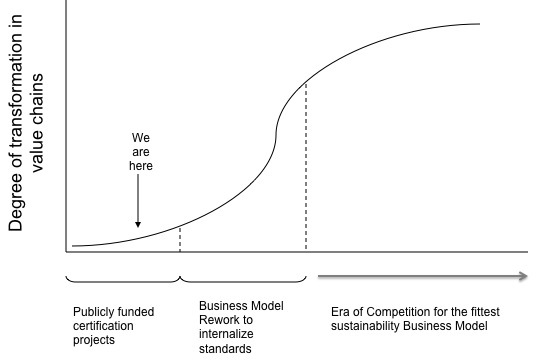 The effects of using the business model could be tremendous, setting examples of successful models and failures, and kicking in a process of economic selection on competing models on integrating sustainability standards. Could this be a way forward in altering firm conduct to better behavior? The low road if you will.